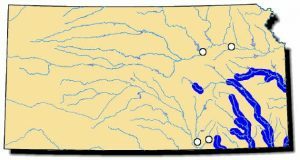 This species occurs throughout most of the Mississippi River drainage from western Pennsylvania north into Michigan and Minnesota, southwest to eastern Kansas, Oklahoma, and Texas; and in the Coosa-Alabama River and Tombigbee River systems in the southeast. 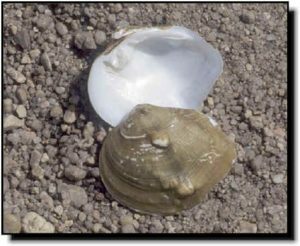 Although once recorded from Lake Erie and its tributaries, recently this species has been confirmed to be likely extirpated from the main channel of the Detroit River between Lake St. Clair and Lake Erie, Michigan/Ontario; due to zebra mussel invasion. Otherwise it is considered stable throughout its range. Comments: The threehorn wartyback typically has three large protruding pustules on its shell which led to its common name. However, sometimes two or four of these pustules are found on each valve. These pustules are arranged alternately from the ones on the opposite valve. The similar-appearing wartyback (Q. nodulata) has pustules arranged opposite the ones on the opposing valve. The threehorn wartyback is a river species, and it ranks near the top in overall density at several sample sites. It is seldom found in small streams. The female releases glochidia in the late spring to early summer. There is some speculation this mussel does not always require a fish host to metamorphose from the larval to the juvenile stage. More research is needed to clarify the life history of this shell.